Engadget says they’re getting reports of Apple sending out shipment notifications this morning from Apple to folks who have ordered iPads! They even use the phrase “flood of tips” – but yet I haven’t gotten my shipping notification yet (boohoo). I’ll let you know when I get my notification! 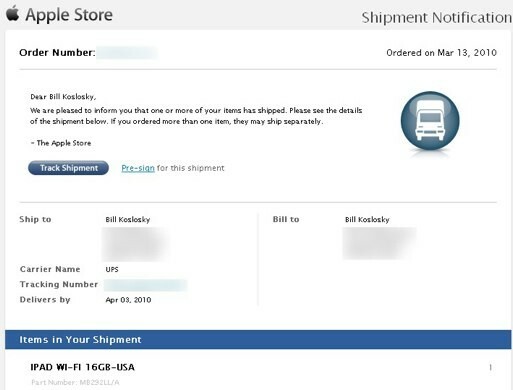 By the way, this doesn’t mean that you’ll possibly be getting your iPad before April 3rd, Apple likely has given instructions to the shippers not to deliver before Saturday – they did this with the iPhone as well.